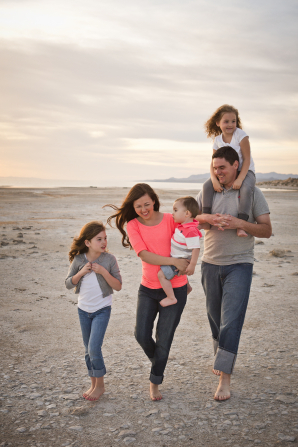 The Church of Jesus Christ of Latter Day Saints teaches that optimal happiness comes as a result of family life. The church further teaches that families were designed by God to consist of a mother, a father, and children. As parents, such men and women have unique roles. Each role is special and essential. Fathers have the charge to support financially, protect physically, and preside, while a mother's central responsibility is in the nurture of their children. The church understands that adaptation may be necessary under less than ideal circumstances. For example, a mother may need to sacrifice time spent with children in order to provide financially in place of a bedridden husband. Or a father may need to stay at home and watch the children as he job searches, while the mother holds a temporary job in the meantime. Even so, we know of at least one characteristic to the family unit that God has declared through living prophets to be unchangeable. Namely, that marriage is between a man and a woman. This does not mean, however, that we are unkind to those who disagree. We believe in treating everyone with love and respect. In addition, we love those whose desire it is to marry and have children, but who do not accomplish these goals despite their best efforts. They are not held accountable for this, and they will yet enjoy every opportunity of ideal family circumstances in the next life if they are faithful in mortality. Writing this article reminded me of the sacred role of spouses and parents. The world becomes a better place when they understand and fulfill their divine duties.